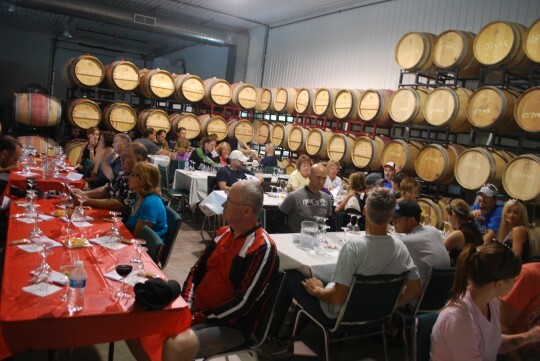 The award winning Windsor-Essex Wine Trail Rides are back again for 2012. Dates for this year’s rides have just been announced with the first ride taking place Saturday May 19th. Each Wine Trail Ride includes a visit to two to three wineries that includes tastings and tours, as well as a meal made with local Essex County products. A guide and cycling expert are on hand to lead the way and answer your questions. As well, a support vehicle follows the tour to collect purchases you make along the way and bring them to the final destination for you. In 2009, the Wine Trail Rides were selected as the Best Culinary Tourism Experience in Ontario by the Ontario Culinary Tourism Association. In 2010, the Tourism Industry Association of Canada (TIAC) selected Adriano Ciotoli and Pina Ciotoli as “Deloitte Innovator of the Year” for the 2010 National Awards for Tourism Excellence for the development of the Wine Trail Rides. In addition to the regularly scheduled rides, WindsorEats also organizes Personal and Corporate Wine Trail Rides which can be scheduled any day of the week. Once the group selects a date, WindsorEats will organize the route, meal and details. These rides include tours, tastings, experienced guide, enhanced, gourmet meal as well as a bicycle and helmet and are ideal for groups that cannot make the regularly scheduled rides, special events, family outings, wedding groups, corporate events, etc. Tickets for the regularly scheduled Wine Trail Rides are $50 each and includes tastings, tours, experienced guide, support vehicle and a meal made with local Essex County products. Tickets can be purchased online.